for Softop, Hard Top, or Fiberglass top. Introducing the ultimate in a safari rack at the very best quality. This rack is THE very finest roof rack on the market for the Suzuki Samurai. 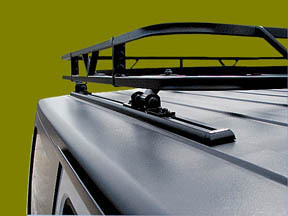 Manufactured from 3/4" HD steel tubing, this roof rack incorporates a sophistocated multi-point mounting system that allows you to carry several hundred lbs of gear on your roof at one time. 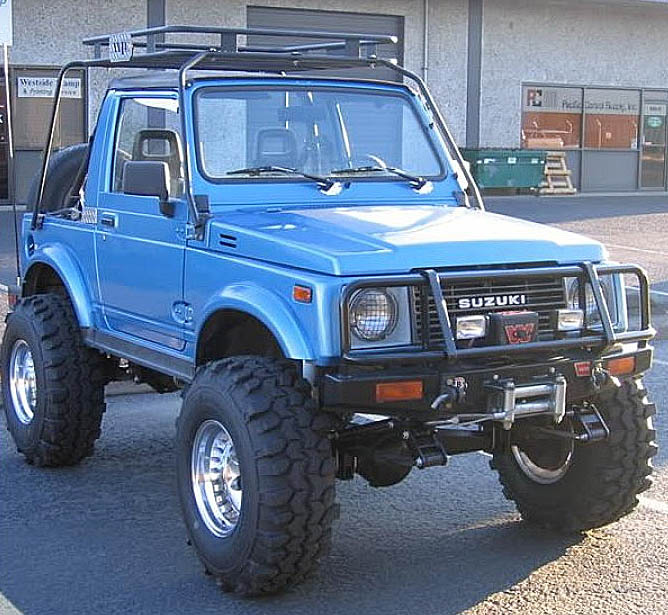 It works for hard or soft top Samurais. The Garvin Wilderness rack is much stronger than any other Suzuki rack on the market. This excellent design allows you to remove or install your softop while the rack is in place. It also is designed to allow the windshield to fold down freely so you can enjoy the full open air treatment of the trail and scenery around you. 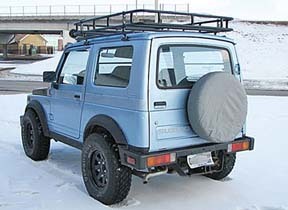 We also carry racks for fiberglass tops and the factory Suzuki Hardtop. All Samurai roof racks come with the mounting hardware and a complete floor system, which can be 'spaced' appropriately to fit your needs. Easy to follow instructions make sure you can get your rack on quickly so you can go play with your new toy! Some of the features pictured here are the Axe and shovel mount. There is also an Axe OR shovel mount available as well. On the other side of the rack you can see the HiLift jack mount. Across the front of the rack are offroad lights mounted to the bolt on light brackets. (such as ski, snowboard, bike, Kayak, etc...) can be mounted with optional mounting brackets. No other rack system on the market for Samurais offers all these features. Super cool prerunner style spare tire mount is manufactured from stout 1/4" steel plate. Features all grade 5 Zinc coated hardware, chain locking system, and black powdercoating. 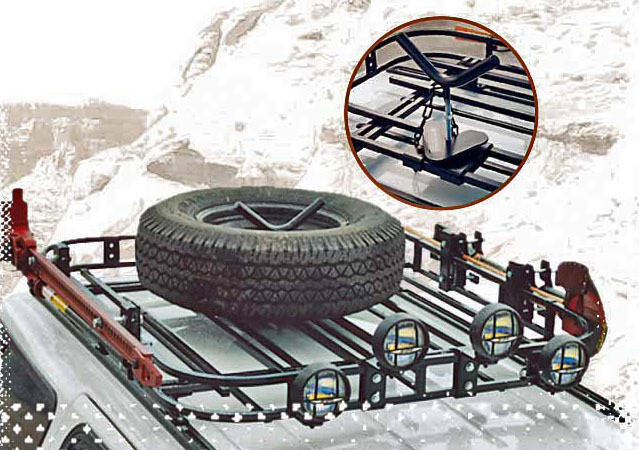 Fully adjustable for any size tire/wheel combo. 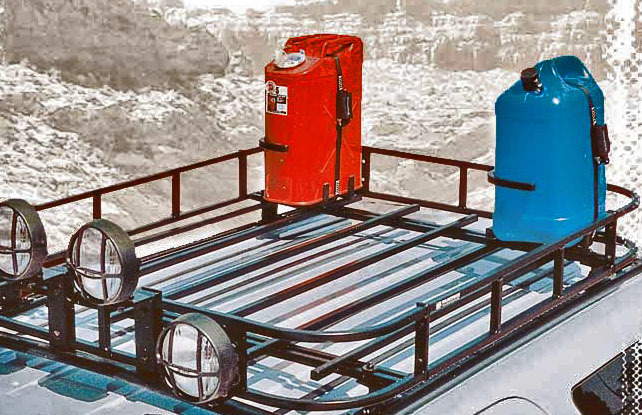 Unique to the Garvin Samurai roof rack system is the Gas Can, or Water Can carrier system. This kit allows you to safely and securely carry these containers up top. A great item for the adventurer who finds pleasure in getting away from it all. The strap system is a cam lock that really snugs the container into place. 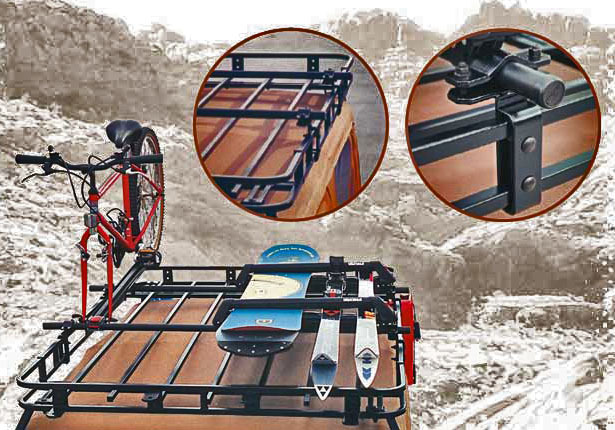 Another major difference with the Wilderness rack series is the ability to mount Thule and Yakima accessories. 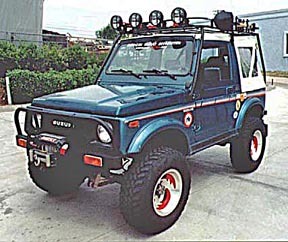 We use this system on our own Samurais to carry our Kayaks and Mtn Bikes. Fits about any accessory as you can see which makes this Safari rack THE MOST versatile setup on the planet. 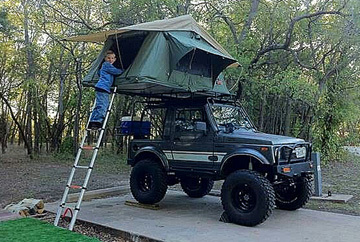 We are happy to carry the best RTT tent kits on the market at this time in kits which will perfectly mount to your Samurai if using the Rocky Road Rails and Crossbar kits, or this Wilderness rack system... no fishing around for additional mounting pieces or scrambling to whip up your own DIY mounting setup. Rocky Road is very pleased to offer these tent kits, the racks to support them, and also pleased that TEPUI used our rack kits on their own vehicles to display their tents in various sales literature and online. If you go to the Tepui website, many of the photos showing the tents mounted are using Rocky Road rack systems. 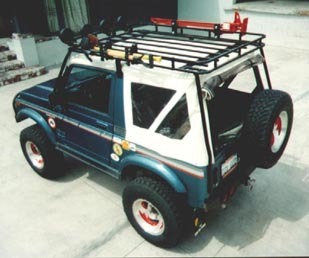 All Samurai roof Rack kits will support our RTT kits. Click on the picture for more information and detailed pricing on RTT kits with free shipping!